Now that The Oogieloves in The Big Balloon Adventure movie is in theaters (as of TODAY), I can officially post my review of it. Some of the reviews I have read from movie critics so far haven't been too favorable. But I wonder how many of them went with little kids?? I don't know about you but I RARELY take my kids to movies because they can't sit for that long, they are constantly needing shushing, or they get scared. This movie is a remedy for all of that!! They can sing, dance, and interact with the movie! I think it's a great idea and watching my kids enjoy it made it worth it for me. I actually got to watch this movie because I wasn't constantly dealing with a kid issue. Admittedly it is NOT geared towards adults (although I liked the guest stars). :) No adult humor. The closest thing would be the Toni Braxton musical number..lol She is not as wholesome looking as the other cast members which just made her part seem a little out of place. Going forward this is the only kind of movie I would take preschool-agers to, otherwise it's just not worth the money I waste pacing with a bored kid in the hall. So this mom gives it 2 thumbs up for my 2 preschoolers! Older kids??? 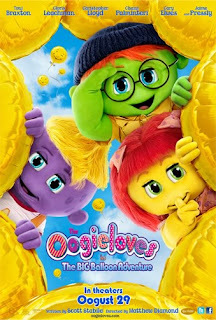 I don't know...but I saw plenty of school age kids singing and dancing :) This movie comes to theaters today! 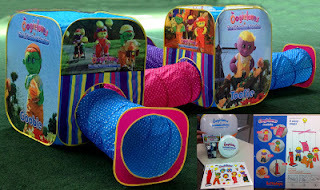 Also be sure to enter to win an Oogieloves Prize Pack!! ($150 Value) The giveaway ends TONIGHT! Disclosure: I was not paid for this review. All opinions are my own.